Dictator Porfirio Díaz stayed in power in Mexico from 1876 to 1911, a total of 35 years. During that time, Mexico modernized, adding plantations, industry, mines, and transportation infrastructure. Poor Mexicans suffered greatly, however, and conditions for the most destitute were terribly cruel. The gap between rich and poor widened greatly under Díaz, and this disparity was one of the causes of the Mexican Revolution (1910-1920). Díaz remains one of Mexico's longest-lasting leaders, which raises the question: how did he hang onto power for so long? Díaz was able to deftly manipulate other politicians. He employed a sort of carrot-or-stick strategy when dealing with state governors and local mayors, most of whom he had appointed himself. The carrot worked for most: Díaz saw to it that regional leaders became personally wealthy when Mexico's economy boomed. He had several capable assistants, including José Yves Limantour, who many saw as the architect of Díaz' economic transformation of Mexico. He played his underlings off against one another, favoring them in turn, to keep them in line. Mexico was divided during Díaz's time between those who felt that the Catholic Church was holy and sacrosanct and those who felt it was corrupt and had been living off of the people of Mexico for far too long. Reformers such as Benito Juárez had severely curtailed Church privileges and nationalized Church holdings. Díaz passed laws reforming church privileges, but only enforced them sporadically. This allowed him to walk a fine line between conservatives and reformers and also kept the church in line out of fear. Foreign investment was a huge pillar of Díaz's economic successes. Díaz, himself part Mexican Indian, ironically believed that Mexico's Indians, backward and uneducated, could never bring the nation into the modern era, and he brought in foreigners to help. Foreign capital financed the mines, industries, and eventually the many miles of railroad track that linked the nation together. Díaz was very generous with contracts and tax breaks for international investors and firms. The vast majority of foreign investment came from the United States and Great Britain, although investors from France, Germany, and Spain were also important. Díaz did not allow any viable political opposition to ever take root. He regularly jailed editors of publications that criticized him or his policies, to the point where no newspaper publishers were brave enough to try. Most publishers simply produced newspapers which praised Díaz: these were allowed to prosper. Opposition political parties were allowed to participate in elections, but only token candidates were allowed and the elections were all a sham. Occasionally, harsher tactics were necessary: some opposition leaders mysteriously “disappeared,” never to be seen again. Díaz, himself a general and a hero of the Battle of Puebla, always spent a great deal of money in the army and his officials looked the other way when officers skimmed. The end result was a motley rabble of conscripted soldiers in rag-tag uniforms and sharp-looking officers, with handsome steeds and shining brass on their uniforms. The happy officers knew that they owed it all to Don Porfirio. The privates were miserable, but their opinion did not count. Díaz also regularly rotated generals around the different postings, ensuring that no one charismatic officer would build up a force loyal to him personally. Reformers such as Juárez had historically managed to do little against the entrenched wealthy class, which consisted of descendants of conquistadors or colonial officials who had built up enormous tracts of land which they ruled like medieval barons. These families controlled huge ranches called haciendas, some of which consisted of thousands of acres including entire Indian villages. The laborers on these estates were essentially slaves. Díaz did not try to break up the haciendas, but rather allied himself with them, allowing them to steal even more land and providing them with rural police forces for protection. Díaz was a masterful politician who deftly spread Mexico's wealth around where it would keep these key groups happy. This worked well when the economy was humming, but when Mexico suffered a recession in the early years of the 20th Century, certain sectors began turning against the aging dictator. Because he kept ambitious politicians tightly controlled, he had no clear successor, which made many of his supporters nervous. In 1910, Díaz erred in declaring that the upcoming election would be fair and honest. 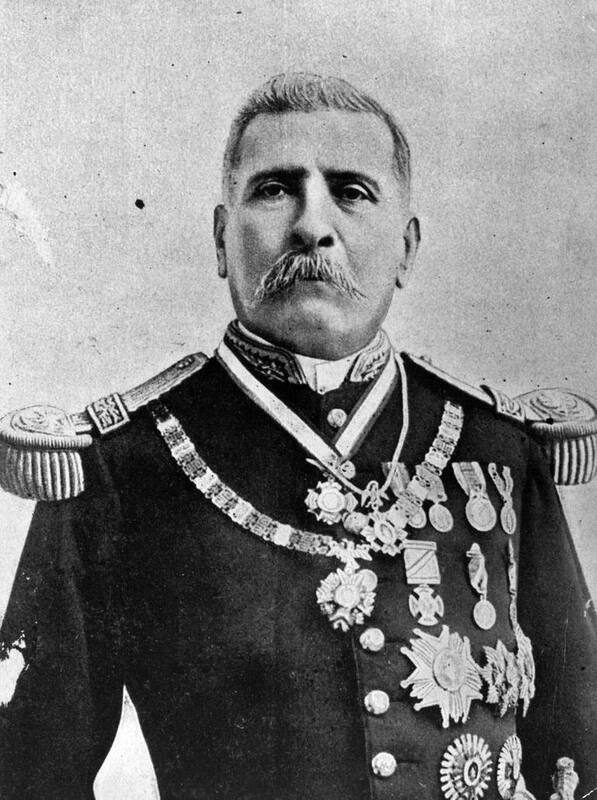 Francisco I. Madero, son of a wealthy family, took him at his word and began a campaign. When it became clear that Madero would win, Díaz panicked and began clamping down. Madero was jailed for a time and eventually fled to exile in the United States. Even though Díaz won the “election,” Madero had shown the world that the power of the dictator was waning. Madero declared himself the true President of Mexico, and the Mexican Revolution was born. Before the end of 1910, regional leaders such as Emiliano Zapata, Pancho Villa, and Pascual Orozco had united behind Madero, and by May of 1911 Díaz was forced to flee Mexico. He died in Paris in 1915, aged 85. Herring, Hubert. A History of Latin America From the Beginnings to the Present.New York: Alfred A. Knopf, 1962.